Philip McLernon: "The idea behind introducing this race was to give handlers and owners a nice incentive to keep older horses in training." To win just once, to win just once....a popular little tune, that, by Irish folk group The Sawdoctors. Well, now owners and trainers of moderate point-to-point maidens will have the opportunity to experience the feeling of winning a race for the first time, thanks to an introduction of a €5,000 contest at Doneraile Harriers on April 28. The race is confined to six-year-olds and up who have not won a race under rules and who prior to the start of the current season (October 6) have not won a point. The race closes for entries on Tuesday. Philip McLernon, chairman of the INHSC Point to Point Committee, said: “We're hugely excited about the running of the older race at the Doneraile Harriers point-to-point on April 28. "The idea behind introducing this race was to give handlers and owners a nice incentive to keep older horses in training, and judging by the reaction the race has received so far it has been a welcome addition to the calendar." Luca Cumani is back home recuperating in Newmarket after spending eight days in Addenbrooke’s Hospital in Cambridge with a serious respiratory problem. The two-time Derby winning trainer was suffering from a rare condition known as epiglottitis, which more commonly affects children. Cumani, who quit training last November after 43 years to focus on his Fittocks Stud business, has returned to the house at Bedford House Stables, which he recently sold to Charlie Fellowes. His wife Sara said: "Luca is back home now and doing well. He had a tube down his throat for much of his time in hospital, which he found frustrating as he couldn’t speak. The doctors said they haven't seen a case like his in 25 years." Award-winning racing journalist and tipster Doug Moscrop has died at the age of 77. Moscrop, from Cramlington, Northumberland, was the North East Journal’s racing writer for more than 50 years and reached the pinnacle of his profession when winning Journalist of the Year jointly with Clare Balding at the HWPA Derby awards in 2003. He also topped the Racing Post Naps table. He was racing correspondent for Tyne Tees television before retiring in May 2006, but continued to write a Saturday column for the Journal for years after. Moscrop died in the early hours of Wednesday morning at the Freeman Hospital in Newcastle. His wife, Joan, died in 2017 and he is survived by his daughter, Susan Robson. Robson, quoted on the ChronicleLive website, said: "I can’t describe how I feel, there is an empty space in my heart. He achieved so much in his life and I’m so proud of him. We went out every Sunday for lunch and that I will miss. "For an ordinary lad from Northumberland, he really did well with his life. I can’t tell you how proud he made us." Tracey Crouch, the MP who stepped down as sports minister in protest over the delay in implementing a cut to stakes on FOBTs, has been appointed to racing's new horse welfare board. Crouch, the MP for Chatham and Aylesford, said: "I am thrilled to be joining the board at an important time for the sport and look forward to being able to combine both my passion in animal welfare with my interest in horseracing." The eight-strong board, which includes trainer James Given and the BHA's director of equine health and welfare David Sykes, is chaired by Barry Johnson, a former chairman of World Horse Welfare. Johnson said: "I am delighted Tracey Crouch has been appointed to the welfare board. Her knowledge of animal welfare issues and integrity will be of enormous value to the sport." The horse welfare board, which also includes representatives from the Horsemen's Group and the Racecourse Association, was created last month and the first meeting will take place in the coming weeks. Three fixtures at Southwell, Newton Abbot and Nottingham are set to start at 12 noon in the coming weeks to assess the betting revenue which is generated from lunchtime betting. The initiative, sponsored by the Horserace Betting Levy Board, is designed to take advantage of increased footfall in betting shops during lunch and also provide greater betting opportunities for digital customers. The three meetings, which will be held on May 1, May 29 and June 5, will all take place on Wednesday afternoon slots. Andy Clifton, racing director at the Racecourse Association, said: “Given the way in which our industry is funded, putting racing on at times when customers have an appetite to bet on it is and always has been important, but that also needs to be balanced with the pressures on horsemen, the desire of racing fans to attend in person and our ability to promote the sport to both existing and potential new audiences. Lambourn is set to stage what organisers hope will be the biggest football match ever on Sunday, when William Dunlop, grandson of late champion trainer John Dunlop, will be aiming to raise as much money as possible for the Injured Jockeys Fund. Anyone can play in the match, which takes place at the Lambourn Sports Club (RG17 8PS), after making a £5 donation and the aim is to have as many people on the pitch as possible. Dunlop, son of Lambourn trainer Harry, is planning several events in the build-up to a 78-mile charity cycle in September. The 11-year-old will undertake the challenge alongside his Lycra-clad father in memory of his late grandfather and is hoping to raise as much money as possible. There is a bar and food and donations can be made at https://uk.virginmoneygiving.com/WilliamDunlop2. Davy Russell has played no small part in the success story that is Tiger Roll and the dual Grand National and four-time Cheltenham Festival winner will be paraded on the streets of the rider's home town of Youghal, County Cork, this Friday. The parade is due to start at 6pm from the Youghal Clock Gate Tower through the town, and all are welcome. Ayr’s Flat fixtures on April 29 and 30 have been cancelled due to areas of the track not being raceable. The BHA will seek to reallocate the fixtures to other racecourses, according to an announcement on Tuesday. Clerk of the course Graeme Anderson explained: “As part of a programme of ongoing investment we have been carrying out drainage work in the home straight for the long-term good of the track following issues in recent years. “We have a relatively short window to complete major works and unfortunately with unseasonably low temperatures in the past few weeks it has meant the course hasn't recovered at the rate we'd like. Stormy Antarctic got his season off to a winning start once again on Sunday, as the Ed Walker-trained stable stalwart landed the Group 3 Kalkmann Fruhjahrs-Meile at Dusseldorf. Stormy Antarctic made a winning start abroad last year at Saint-Cloud, and this time swapped France for Germany with the same result. Gerald Mosse was aboard the six-year-old son of Stormy Atlantic, with the pair prevailing by a neck. Speaking on Monday, Walker said: "He's a good old boy and never lets us down. He probably just needed the run and was getting a bit tired in the final half furlong but Gerald did a great job of nursing him home. It's a good start to the campaign and that's his fourth Group win. He's quite remarkable." There are no shortage of options for Stormy Antarctic for the rest of the season, and Walker added: "I'm sure one day when the stars align he'll pop up in a big one, he deserves to bag one somewhere. He's in the Lockinge but wouldn't run unless it came up soft and it didn't look ridiculously hot. He's in everything, I'd love to go back to Germany and win the Badener Meile he won last year." Trainer Mark Hoad has revealed he is appealing against the decision of the stewards at Chelmsford last Thursday to demote Hurricane Alert after he had passed the post first in the 5f handicap. The seven-year-old, ridden by Jack Mitchell, was disqualified and placed second after stewards' decided he had "shifted marginally right-handed, causing David Egan, the rider of Kyllukey, placed second, to have to take a check for a couple of strides." Hoad said on Monday: "I've decided to appeal the decision. I've watched the video back over the weekend numerous times and spoken to Jack, who's also gone through the video. "We all think there has been an injustice and basically we want to put it right. The appeal will either be going in late today or tomorrow morning." There will be a service to celebrate the life of Jean Bucknell, the much-loved gallops stalwart who died last Tuesday aged 82, at Newmarket's St Mary's church on Friday, April 26 at 1.30pm. Before the service there will be a private cremation at Bury crematorium at 9.30am, before which the hearse will pass along Bury Road and visit the Limekilns, where Bucknell enjoyed watching work. Mourners are asked not to wear black ties or dark clothing to the afternoon service, as "Jean wanted no tears but only smiley faces", according to her partner David Goodwin. After the service, there will be a wake at the National Heritage Centre at Palace House at 2.30pm. Any donations to Racing Welfare. Leicester racecourse has been fined £3,500 for potentially putting runners' safety at risk in February. During the running of the Cottesmore 'Grassroots' Maiden Hunters’ Chase it was reported that a fork had been left on the landing side of the sixth fence. It had been believed that the fork had been left behind the fence when the groundstaff had been treading in. 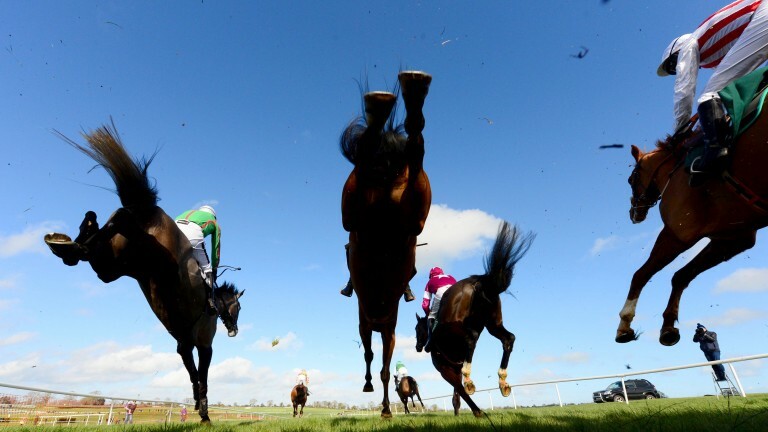 In failing to ensure the course was fit for racing, the runners’ safety had been potentially put at risk, a disciplinary panel notice said on Monday. Bookmaker bet365 will continue their sponsorship of Newmarket's three-day Craven meeting for another three years, it was announced on Monday. The firm have sponsored the meeting since 2017, and Pat Cooney, head of PR for bet365, said: "We are delighted to continue our support of the Craven Meeting for a further three years, maintaining our close relationship with Newmarket racecourses. "Our association with this meeting goes back many years and we're looking forward to welcoming in the new Flat season at the home of horseracing." The BHA has announced two provisional new hurdle races at Taunton's fixture on April 24. This is because, in light of the prevailing good to firm going and weather forecast, the ground may not be suitable for the two chases currently programmed. Entries for the two new contests, as well as the six existing races, will close at noon on Thursday, and a decision taken as soon as possible as to which set of races will take place. Taunton managing director Bob Young said on Monday: "With no recordable rain since April 10, and following the high winds over the weekend and still blowing today, the ground is currently good to firm.